Tooth loss can occur for many reasons (periodontal disease, decay or trauma). Dentures have been used to replace missing teeth for many years now. Alternative methods used to replace missing teeth include dental implants and fixed bridges. Smile Studiofor donating the images. The loss of your teeth can have negative effects on your self-confidence, your ability to chew food and your bite. Since your teeth provide structure and support to your cheeks, tooth loss can result in the sagging of your cheeks and make you appear older than you are. It is essential that your missing teeth are replaced as soon as possible. Dentures are removable replacements for your teeth, designed to look and function like your own natural teeth and surrounding gum tissues. 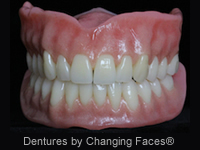 Modern-day dentures can look very realistic and natural and feel comfortable. When all your teeth are missing, a complete denture is used to replace them, whereas if only a few teeth need replacing, a partial denture or overdenture is used. Partial dentures can prevent your existing healthy teeth from shifting following tooth loss. Dentures are generally fabricated from acrylic resins. With advances in modern cosmetic dentistry, there are a wide variety of materials available for dentures, and your dentist may give you some options, including the latest flexible Valplast cosmetic dentures. Dentures should be held in place by their natural suction to your gums; sometimes a fixative may also be used. However, they tend to come loose and this can cause difficulties when trying to eat certain foods. Dentures can be fixed securely in place by dental implants or mini implants, which can give you the confidence to eat whatever you want without having to worry about your dentures coming loose or falling out. More patients seem to be opting for treatment with implants now. Despite their high cost, they have a dramatic effect on improving the quality of life. How should I look after my dentures? It is important to keep your dentures clean at all times. You should remove your dentures at night to give your gums “a rest” and the chance to be exposed to your natural saliva, which will keep them healthy. It is highly recommended that you brush your dentures and soak them in a glass of cold water whilst you aren't wearing them. You can add special cleaning tablets to the water when you soak your dentures. Always brush your dentures before putting them back into your mouth. If your dentures begin to collect debris or stains that you cannot remove by normal brushing, your dentist or hygienist will be able to professionally clean your dentures for you. It is important to visit your dentist regularly to ensure that your dentures are in good condition and continue to fit your gums, as the shape of your gums and underlying bone can change with time. Loose fitting dentures can cause irritation and inflammation of your gums and problems with eating and speech. This depends on many factors, including how you take care of them and also how much you use them in terms of general wear and tear. Over time, dentures can become loose as your gums shrink and your bite changes. When this happens, you may need a new set of dentures, or in some cases, a simple modification of your existing dentures may solve the problem. On your first appointment, your dentist will assess your needs and thoroughly examine your mouth for suitability for dentures. Some of your existing teeth may need to be extracted first or you may need treatment to get your gums into good health before commencing any treatment. An impression (mould) of your gums will be taken and used as a model to fabricate your dentures to fit the contours of your mouth exactly. A dental technician will make your dentures to your dentist’s exact specifications. In cases where teeth need to be extracted, the structure of your gums and surrounding tissues needs to heal before your final dentures are made. In such cases, an immediate denture will be placed to enable the gums and surrounding tissue to heal properly. Immediate dentures can be easily modified during the healing process, which could take several months.